In the 23rd century, mankind has fled earth and emigrated to the moon. The last outpost of civilization is the Lunar Republic of Eden, where the omnipresent Citizens Administration Council grants residents everything they need. But, what do you do when you discover everything you believe is a lie? 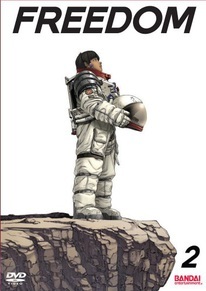 Seeking the truth, Takeru and Biz escape from the Moon and land on the desolate, yet recovering Earth. The two travel across America, looking for the location and girl depicted on the picture found on the lunar surface. What waits them when they finally find what they're looking for and will Takeru ever get back to the moon as he promised his friend, Kazuma, who was left behind on the moon? Special Features: Talking About Freedom 2, Fly Me To The Moon 2, Freedom in the USA 2, Freedom Digest 5-7, Next Episode Previews, Trailers.